This entry was posted in Race Updates on July 31, 2007 by WSG. Check out Steve Edwards race report from the WasatchSpeedGoat 50k! Steve’s race report sums up the course. Next years race is slated for July 26, 2008 with a longer course and less turns! We will post when the race opens way ahead of time you so speedgoats can plan accordingly. Thanks again all SpeedGoats! This entry was posted in Race Results on July 30, 2007 by WSG. This entry was posted in Race Updates on July 27, 2007 by WSG. Special thanks to everyone who spent the day on the hill with the runners! One of the top three comments I heard was what great help at the aid stations! Karl and I staffed each age station with professional ultrarunners who understand the needs of a runner during such a grueling course! We had Roch Horton and the Black Diamond crew manning Mt. Baldy and Roch himself making sure every runner left his aid station at the top of little cloud to the finish, plunge to the tram deck! At the top of the tram we had Jared Campbell (just broke 30 hours at Hardrock 07) and Larry O’neil. Down at the tunnel we had fellow Montrail Team mate Ken Jensen with Charlie Vincent and the Backcountry.com crew! Special thanks to Mark Scholl and the Salt Lake Regional Medical Center for being there for the runners! A SPECIAL THANKS TO WYNN DAVIS FOR THE TROPHIES! Wynn Davis created our special trophies for the Innaugural race and deserves a big thanks from all of us who were able to participate last weekend. Without Wynn’s dedication to making these works of art, the “Goat Leg” and “Hooves” would have been alot harder to create, and a special thanks to Elwood the Goat for all his hoof growing power! Wynn will be racing here next year and will have a shot at taking home a goat leg of his own. – 10 Scrapes! Nathan Packs were donated by Glenn at the Wasatch Running Center, go there to get the Nathan 20% discount! The ultimate sponsor that allows trail running to be a spectator sport with that killer TRAM and course! Snowbird and John Collins! Remember that ridge, the second climb! If you feel good after running 24,000 vertical, it was the 80-90 servings of Ultragen that was consumed, thanks to Robert from First Endurance for helping with Goat recovery, bahaha! Last but least thanks to Butch race director for the Wasatch Steeple Chase for running the timing system at the finsh line, suds for all Butch! This entry was posted in Race Updates on July 25, 2007 by WSG. Check out these scenic photos of the Wasatchspeedgoat 50k! Erik Storeheim crossing the top of the tram! Trail Run Gear use this code (1QL-1-QGSDU) and receive 10% Speed Goat discount off your order at the Speed Goat Trail running Gear Shop! Check redemption code and enter code during check out! Expires July 31st ! Results posted tonight, no kidding! Any SpeedGoats who would like a Nathan Pack for trailrunning, please go see Glen at the Wasatch Running Center and he will give you a 20% discount if you mention this web page and article, cool! This entry was posted in Race Updates on July 22, 2007 by WSG. Yes, it is true! Petra McDowell had the Sharpest Hooves of the day! Full race report coming shortly. Way to go Speedgoats! Powder Shots photo’s are in! Helen Cospolich reaching for her $100 bill at the top of the tram! First male and female to the summit got the cash! Scott with First Place Petra McDowell and First Place Male Corbin Talley! Dan Young “Dark Vader” from PA. cruising out the tunnel! CHECK OUT THE VERTICAL CHART ~ Thanks Joel Hatch (11,997) climbing in 27 miles, ouch~ the real Wasatch 100 warm up race. Way to put down the Ultragen and cold ones SpeedGoats! This entry was posted in Race Updates on July 18, 2007 by WSG. Thanks everyone for signing up for the first ever WasatchSpeedGoat “Get High” 50k! This has been a daunting task getting such a killer race put together at the top of Little Cottonwood Canyon, we would like to request all runners please car pool and utilize the “park and ride ” at the bottom of Little Cottonwood Canyon. Snowbird has been very accommodating to partner with us to showcase the best 50k trail run venue ever! We really want to be the best environmentally conscious people we are, as you run through the course please do the best you can not to leave any waste behind! There will be restrooms at the start/finish and at the top of the tram where you cross twice, Thanks for the help! This entry was posted in Race Updates on July 17, 2007 by WSG. I hope every one’s training went well! Please review the final instructions for the race, we will see you on the tram deck at 5:30 am for packet pick up ! This is a steep course with 5 climbs, be patient you want to feel good for those last two climbs of the day! This is a Meltzer designed course, we expect the winning time to be around 6 hours so don’t think you’re going slow, everyone is going slow !! Sharpen your hooves, we will see you 7/21/07!!!! Get ready to dance through the rocks! This entry was posted in Speedgoat Updates on July 16, 2007 by WSG. 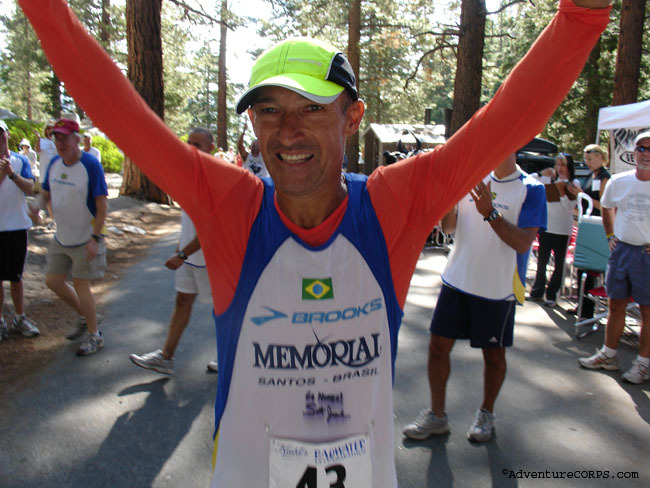 TO NO SURPRISE, JUREK TAKES HARDROCK WITH A VENGEANCE! This entry was posted in Race Updates on July 13, 2007 by WSG. Live updates throughout the day and night on Meltzer and Jurek! Denesik and Meltzer pull into Pole Creek two minutes ahead of Jurek ! Jurker back in front w/ Denesik followed by Hartell and Meltzer 2 and 3 minutes behind at Sherman! Things are heating up! Hartell is 2 minutes ahead of Jurek and 4 minutes ahead of Meltzer at Grouse Gulch mile 42.1! Now the race begins, Meltzer is patient~Jurker looks strong, can Hartell hold the pace? Hartell leads Jurek by 2 minutes and Meltzer by 13 minutes as they left Engineer Pass at mile 48.6, we got a race! Emily Baer left just 10 minutes in front of Krissy Moehl from Grouse Gulch, the women’s race is going to be a barn burner! Jurek leads Hartell by 4 minutes and Meltzer by 17 minutes at Ouray mile 56.6. They just finished a long down hill from Engineer, now it ‘s time for Meltzer to make a move up the long climb to Virginia Pass-? Jurek leads by Meltzer by 16 minutes out of Governer’s Basin, Hartell fading! Emily Baer leaves Ouray 4 minutes ahead of Krissy, who will win this one? Jurek crosses Virginia Pass just 6 minutes in front of Meltzer at mile 67.7 ( long climb). Steep downhill to Telluride, not real technical-Jurek advantage? First runner through Chapman should win! Jurek is the first runner through Chapman and may be on his way to victory! Krissy looks as if she might hold off Emily for the women’s victory! Could Jurek post a course record? Jurek just finished at 8:08, what a great run Scott, congratulations!! 26:08- record! Meltzer showed up at Chapman Gulch and hour behind Jurek and took a two hour break, he is back up and fighting for a second place finish! Krissy is in 4th place-21 minutes behind Meltzer at Kamm Traverse go Krissy! Meltzer just passed through Putnam with some impressive splits considering he came back from the dead! Hang on for sub 29 WHSG! Meltzer hung in there for second place at 10:59, 28:59! Way to hang for sub 29. How to take a 2 hour nap and still finish 2nd at Hardrock??????? Krissy Moehl – First women in at 11:24, 29:24 !! Super congratulations !! She finished third behind Meltzer! wow~Female SpeedGoat kicked up some dust out there! Course Record !! Watching for fellow Speedgoats Roch Horton, Ken Jensen and old rival Todd Salzer!! Keep on scraping! Imagine that: Roch Horton and Ken Jensen are on there way in from Putnam on the same splits! The Salt Lake boys finished the same time, nice work! Watch the Video of Scott’s finish! This entry was posted in Speedgoat Updates on July 11, 2007 by WSG. Hello Fellow Speed Goats! Park City TV is going to film the race this year and make a one hour documentary which may focus on a specific runner. I am looking for a trail runner who has overcome adversity of some sort that has a worthy story to tell! Park City TV may then do pre race interviews and film you through out the race, if you feel you are a Speed Goat with a killer story, please e-mail Ori Hoffer at Park City TV ori@parkcity.tv . C-ya next weekend, sharpen your hooves!! Bahaha! This entry was posted in Race Updates on July 9, 2007 by WSG. 6 Previous winners will toe the line with Mr. Jurek! The Hardrock 100 is set up to be the most competitive ever! This entry was posted in Speedgoat Updates on July 9, 2007 by WSG. We did a monster trail run up Mt. Timpanogos on Sunday, this is our local Heber City mountain that sends you up a 7 mile climb with 5000 vert. Robert Redford has his little ski resort here called Sundance . I ran with Mark Scholl (Medical support for the WSG 50k) from Salt Lake Regional Medical center, Joan Parker a WSG 50K runner and local runner young Josh Turner. What a massive climb crossing snow and scree fields to top out at 11,700 with a 5000 vert. descent to the car! This will test any trail runners fitness level! This entry was posted in Training Tips on July 4, 2007 by WSG. What to do with empty gel packs during a 100 mile race? When I was running the Bighorn 100 this year I discovered the convenience of putting those empty gel packs under my water bottles inside my Nathan Pack! This works real slick, they are easy to pull out and dispose of at the aid stations while the crew fills your bottles. Did you ever finish a 100 miler with a pocket full of empty gel packs that dried into a clump of crystallized sugar? The empty gel packs end up a little wet from the water bottles so they do not stick to the pack, this is for only waist belts. If you have a convenient way to rid those sticky gel packs into a running back pack, let us know! Remember speed tip based on eating two to three packs of gel per hour! Bahahaha!